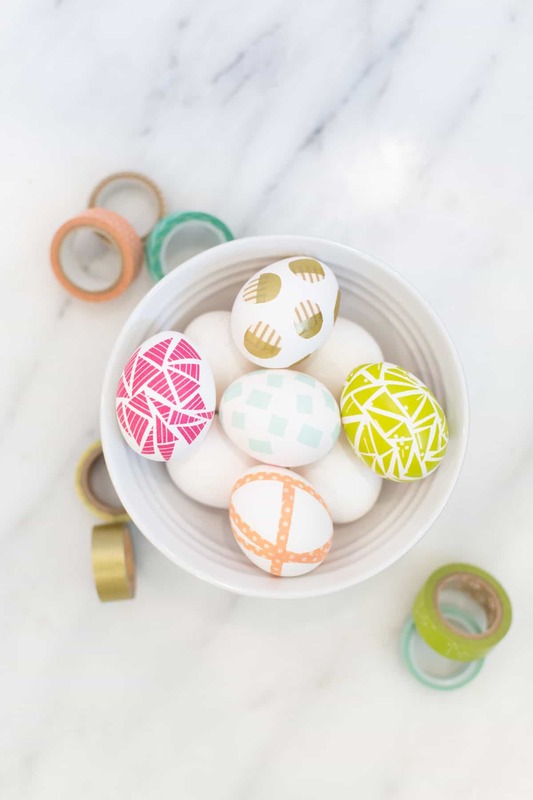 If your budget doesn’t stretch to expensive store-bought decor eggs try these so-pretty washi tape Easter egg designs instead! No one will know the difference! If your Easter traditions are not complete without a bowl of pretty decorated eggs on your table you are going to love today’s collection! 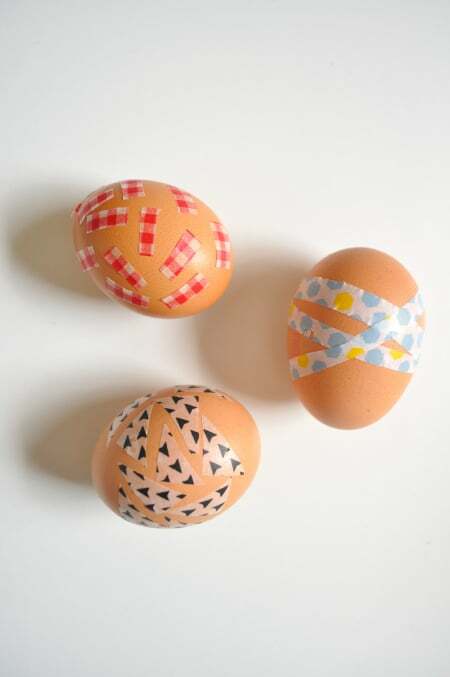 We’ve been out searching for the best washi tape Easter egg designs we could find. Why tape? Because if you haven’t got a roll or two on your desk already it’s pretty cheap to buy, yet makes for a very expensive looking egg! Think Anthropologie expensive! Oh and these DIYs are so easy you can turn it into a family crafting session and spend some quality time with your kiddos! 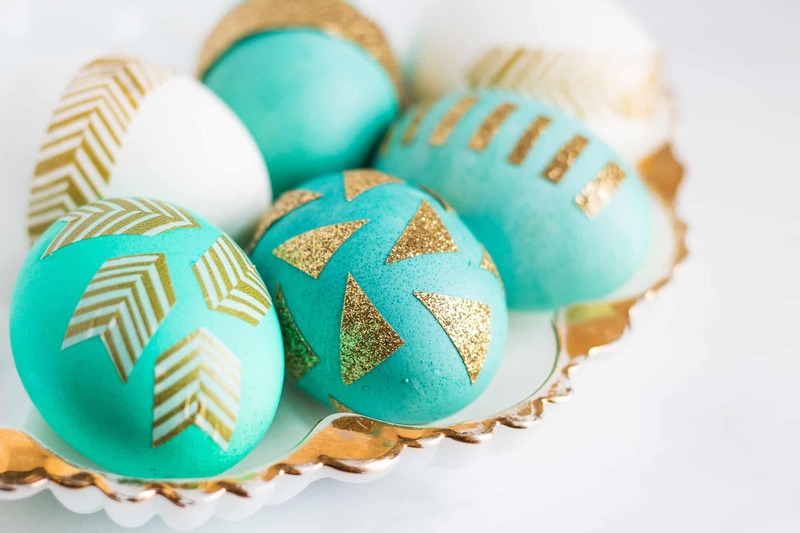 For a very glamorous looking Easter egg grab your gold washi tape and your circle punch to create this two-toned polka dot effect! 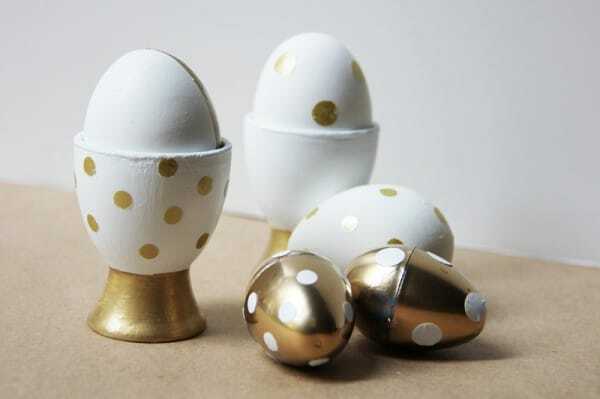 If you prefer an eclectic look to your decorated eggs take a look at these ideas from Lovely Indeed. 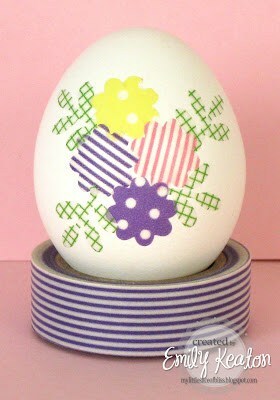 She shows you how to make a geometric striped egg, a confetti style egg, a polka dot effect and a geometric triangle egg! Here’s a way to take your washi tape designs to the next level, by combining the tape with metal leaf! 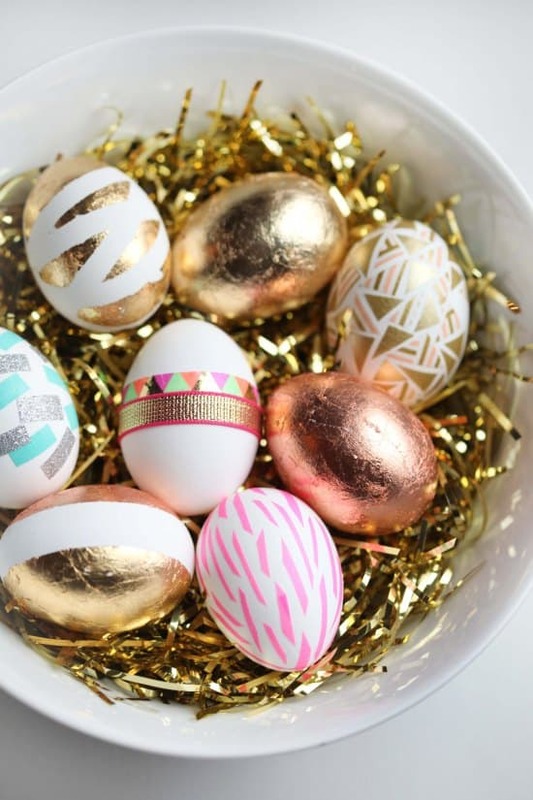 The end result is a very instagram-worthy egg display! If you’ve never made chevron stripes with your washi tape before check out this tutorial over at Lovely Indeed. So simple, yet so clever, just make sure you have some small sharp scissors. I found some vintage stork ones just like Chelsea’s over on Etsy in case you’re crushing on a pair too! I love the colour of these eggs, and teamed up with the gold washi they do look like they just stepped off of an Anthropolgie shelf! One word of caution before you click through for the directions, the post is filled with cuss words. So if that’s not your thing keep scrolling until you find another design you like! 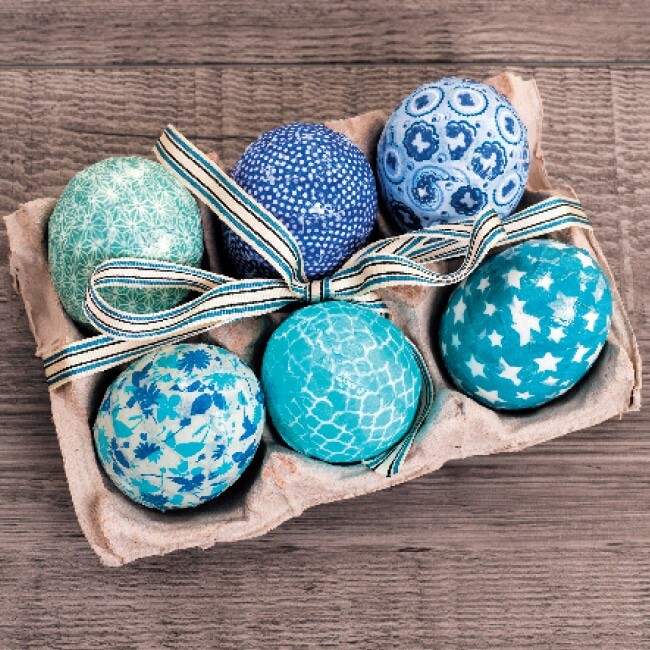 If you have some Spring or Easter themed punches in your craft box go and grab them now so Martha can show you how to make these cute eggs with them! 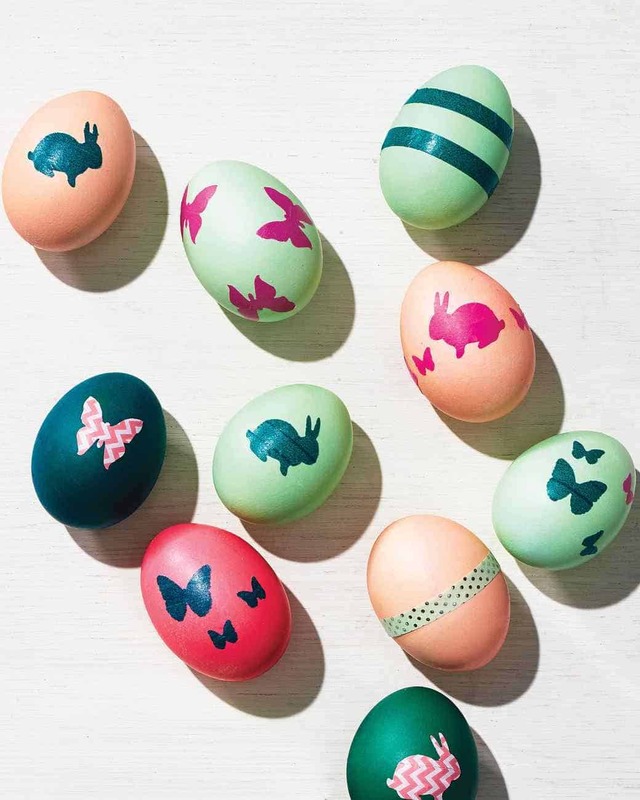 How fab do these eggs look? I love the wrap effect of the tape. 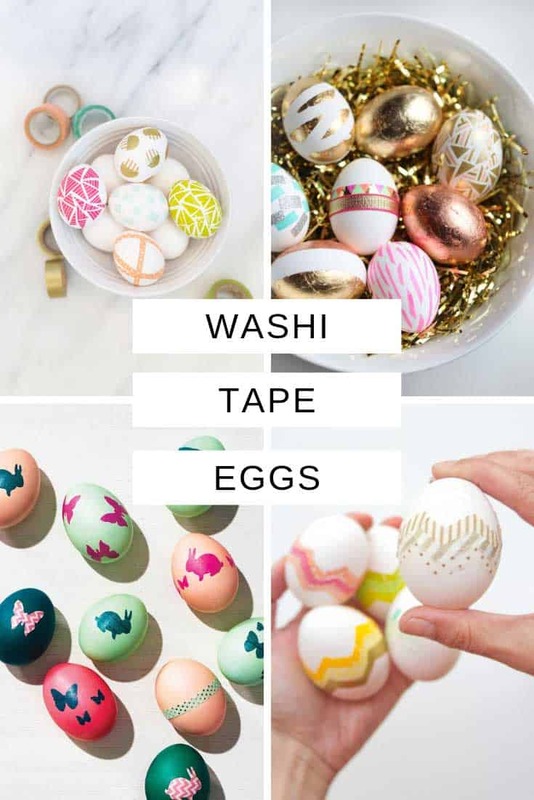 And such a clever idea to not only use the washi tape to add some sparkle to the eggs, but to create a relief effect in the dye too! 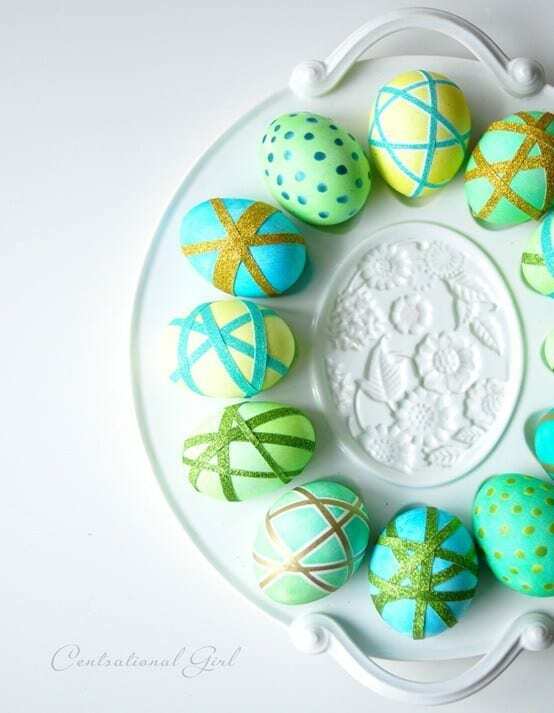 Oh here’s a sweet idea if you want to bring a Spring florals vibe to your eggs this Easter! You’ll need a floral craft punch for this one. Up until now all of the designs I’ve shared have been based around making shapes or patterns with your washi tape. But what if you want to go for a decoupage, or fabric covered egg design? You can use your tape for that too! 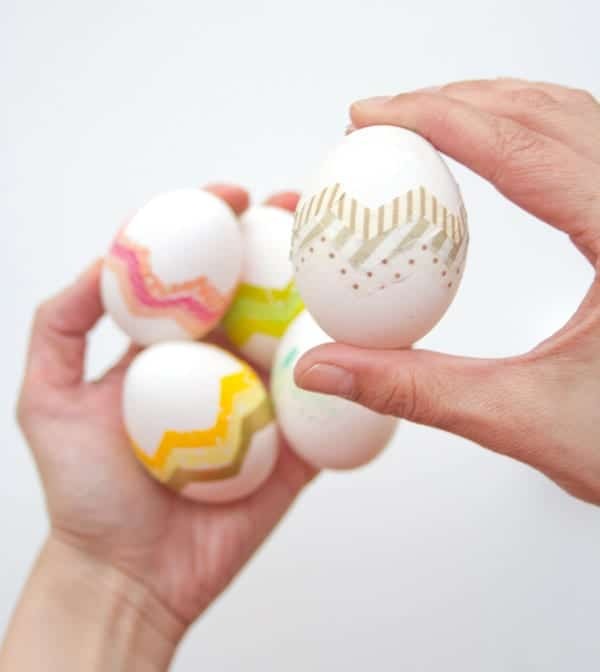 You don’t have to reserve your fancy designs for your display eggs, because the tape sticks just as well to the plastic ones you’re going to fill with candy for your Easter Egg hunt or baskets! 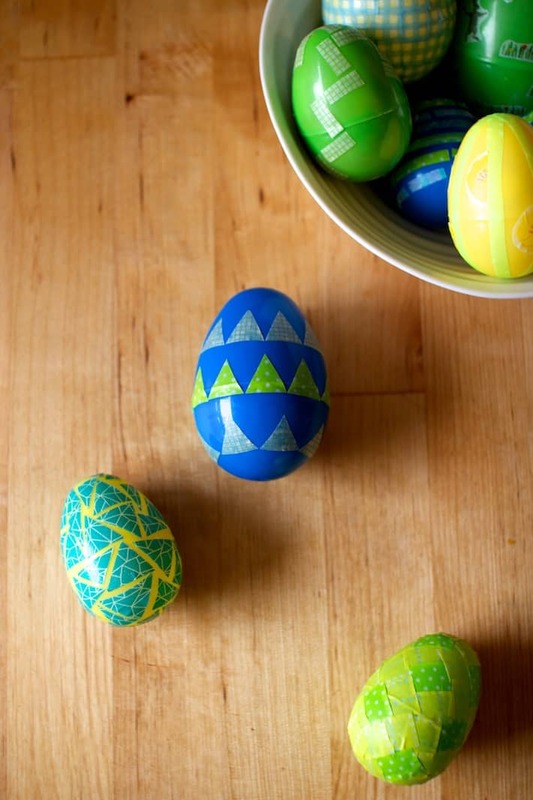 If you’ve forgotten to buy wooden eggs from the store, and you don’t have time to dye your eggs at home don’t panic! 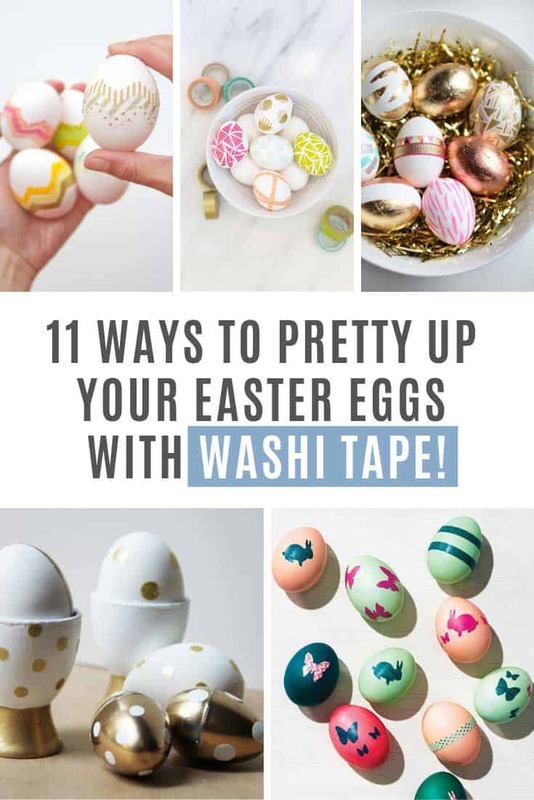 You can just hard boil them and go for an au natural look with the washi tape to bring your eggs to life!